Very rarely do you experience moments in which you know, right then and there, that everything is about to change forever — a turning point that will be eternally etched in the timeline of your life. Sometimes, however, there are instances where change is tangible. You can sense it while it’s still happening, giving you an almost out-of-body perspective. For me, this happened recently: the ephemeral moment in which I first realized I was about to be a world champion for the first time in my career. It’s that feeling of knowing you have the race won, and the euphoria that comes over you, prompting you to express yourself in jubilation. It happened in the 4x200-metre at the IAAF World Relays in the Bahamas. Those last 20 metres felt like a mile, and after I looked over and saw that I was clear of my competition, I had time to contemplate how to assuage my instinctive desire to celebrate. So I began thinking — what should I do? What is a symbol that encompasses all the years of hard work we’ve put in as a nation to earn respect from our contemporaries on the elite stage? Something that says: no matter how many times we fail, our faith in each other is unwavering and we will come back as a team united, despite all the outside noise. And then suddenly it became obvious. Throw up the X: an expression of perseverance, while simultaneously crossing out all the negative energy reverberating from our past failures and the naysayers. Although the event wasn’t entirely magical — a miscue costs us a 4x100 medal — my recollection of the championship can be summarized with a series of triumphant snapshot moments that I will remember forever: reveling in the moment while wrapped in the national flag during our victory lap following the 4x200 race; standing on the podium, this time on the middle stand after being introduced last, as the victors. Looking into the crowd and a sea of Canadian flags, a spectacle I’ve never seen before at a championship outside of Canada. The mellifluous national anthem playing as we watched the Maple Leaf ascend highest. The culmination of it all had me contemplating; with a few generational talents reaching the end of their careers, the sport will be looking for successors and on that night, I could feel our emergence into contention as a perennial sprint nation. The landscape of the sport, post-Usain Bolt and a few other aging legends, is becoming a lot more level. With Canada entering a golden age in terms of sprint depth, we are well-positioned to take full advantage of that parity. To expand on this, consider the following series of questions: when is the last time you saw Canada with two active sub-10 and sub-20 sprinters in the same year? Have you ever before seen three Canadians in a Diamond League sprint event? When is the last time you saw Canada on the podium at three consecutive championships in the 4x100? When is the last time it has taken sub-10 and sub-20 performances to win Canadian nationals? Clearly, all of this alludes to a new day and age for Canadian sprinting and a sign of great things to come. This didn’t happen overnight. The OGs metaphorically passed the baton for a decade in the post-90s generation, capped off in 2012 when the Canadian 4x100 men finally broke through to momentarily win bronze in London. Although it was ultimately forfeited, I believe this marked a turning point that signaled the re-emergence of Canadian sprinting. It brought credence to a mantra that our coaching staff had always disseminated to our team — which was that our current crop of sprinters had the potential to compete for medals on the global stage. Granted, we still have a lot to prove. We are emerging as contenders in the eyes of some, but not everyone is sold. As a team, we still have things to achieve and heights to reach before we can join the truly elite in the minds of the pundits. We are still susceptible to making mistakes, and sometimes our biggest competition on the track is ourselves. Though as they say, perfect is the enemy of progress; if we focus on chasing the elusiveness of perfection, we miss out on the opportunity for growth and progression that comes with making mistakes. Making errors has been the catalyst for growth in our relay team for years. We have shown the propensity to rebound from mistakes in pursuit of redemption. My individual endeavours — Nobody Knows my Name by CBC Sports reporter and former national track team member Anson Henry — summarize my quest for global validation. The objective of the piece was not to complain or to alienate my existing fans, and I recognize that I do have a following who believe in my talent and who have supported my journey through triumphs and tribulations. Rather, we wanted to highlight the untapped potential to achieve great things that I believe I have which people recognize and have been patiently waiting for me to bring it to fruition in high-level, individual success. 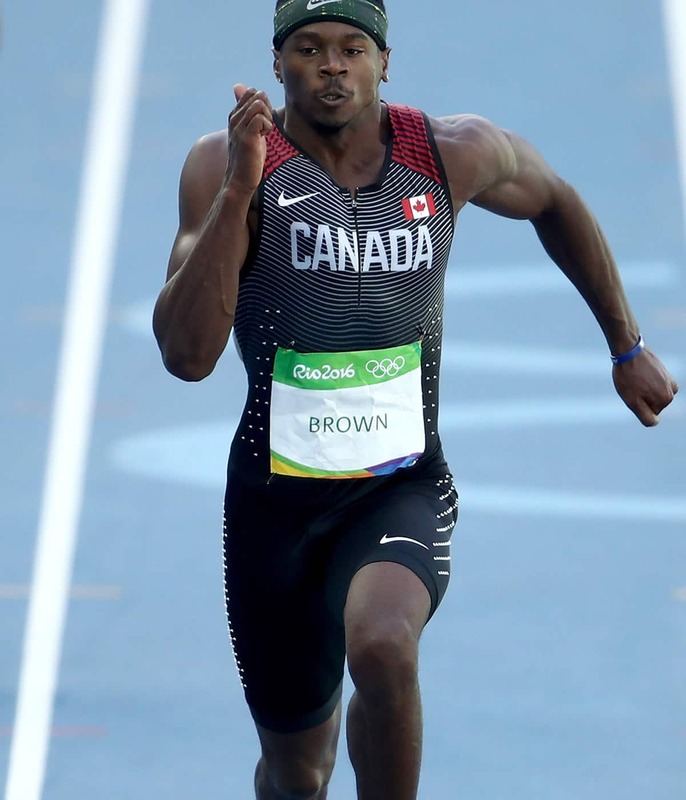 Sprinting is a sanctuary for Aaron Brown. I embrace my own shortcomings and inconsistent performances, both individually and as a part of the relay contingency, because track is an entirely mental sport. You have to believe that no matter how many times you come up short, your talent and preparation will ultimately manifest at the right moment. All it takes is that one breakthrough moment, when preparation meets opportunity — amalgamated with a little bit of serendipitous timing, good health, and good fortune. In the last quadrennial Olympic cycle, we earned two world championship bronze medals, an Olympic bronze, and a new Canadian record in the relay. So now that we’ve gotten to this point, where do we go from here? What can we achieve as a collective on the international scene? I dare to dream that a world championship and Olympic gold in the 4x100 is not beyond our capabilities, as we continue to improve and get faster collectively. As for myself, I believe I can be an individual medallist, and I’m going to speak it into existence, because it all starts with a vision. We have already witnessed one Canadian sprinter achieve this feat, and much like the Usain Bolt phenomenon in Jamaica, Andre De Grasse’s breakthrough successes have galvanized the rest of our country. We have all been forced to step up our game, because none of us are content with backseat roles; we all want starring gigs in the movie. This won’t be an easy, linear ascension, however, and there will be more lessons learned on the way, but adversity is what makes us stronger. Countries like the United States and Jamaica will replenish and remain perennial powerhouses, while other countries such as South Africa, Japan, Great Britain, and China will only continue to ascend with burgeoning talent of their own. As for me, I’m relentless in my pursuit of greatness and I am not easily deterred. Although I am a sprinter, the journey to becoming an elite calibre athlete is ironically better categorized as a marathon. There will be huge voids left in the sport when some of the greatest to ever grace a track take their final “on your mark” commands. The world will be searching for someone to take the reins. Why not us? Why not me? This opportunity can be summed up by a sign that says we are ready to take the next step and emerge into serious contention for global sprint supremacy. A simple, yet elegantly powerful statement; a gesture to symbolize what is to come for Canadian sprinting, indicating that we are no longer just happy to be here. Team Canada is here with serious intent — we are X-rated.